"The Trusted Name in San Diego Real Estate"
With over 1,500 successful transactions and over 1 Billion in sales, our award-winning agents and expert staff always put your needs first. We welcome the opportunity to assist you and your family with all of your Real Estate related needs. See why Dennis DeSouza is San Diego's trusted name in Real Estate. 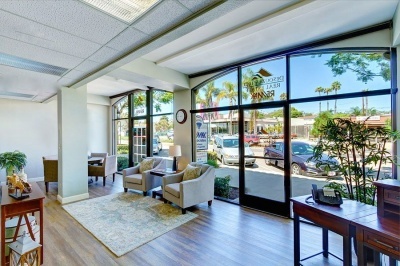 Feel Free To Stop By And Visit Our Upscale La Jolla Office! In 2016, Coldwell Banker agents handled more than 21,000 transaction sides of homes priced at $1 Million or more, averaging $106 Million in sales every day! We are dedicated to helping buyers and sellers with their La Jolla real estate, Del Mar real estate, Rancho Santa Fe properties and Greater San Diego area Real Estate requirements. One of our goals is to provide clients with the knowledge and resources needed to make their next real estate transaction a success, which is why our site is complete with community information and the latest property listings throughout San Diego County. We serve the entire Greater San Diego area and specialize in La Jolla CA homes, Del Mar real estate, Rancho Santa Fe properties, San Diego real estate, and Downtown San Diego condos. This beautiful seaside area features exquisite waterfront and ocean view properties, as well as the finest penthouse suites and inland homes. To bookmark properties, save your search parameters, and to receive email updates about new listings, sign up for free today. Our site features a comprehensive listing search that features homes for sale throughout the region. Our San Diego listings are available 24/7, and allow you to search for homes by community, price, property type, or days on the market, as well as search for foreclosures and short sales throughout San Diego County. When you search for homes on our site, you'll find complete property details, high-resolution photos, virtual home tours, and detailed Google Maps. We also offer neighborhood Walk Scores, as well as the ability to share listings with friends via Facebook, Twitter, and Google Buzz. If you register, you can also bookmark your favorite San Diego, Rancho Santa Fe, or La Jolla homes for sale, save your preferred search parameters, and receive email notification when new properties enter the market. If you see a property that interests you, please don't hesitate to call (858) 344-4068. La Jolla is conveniently located just 15 minutes from Downtown San Diego and is one of the premier coastal communities. Featuring waterfront real estate, golf course homes, and other luxury properties, buyers will find an exquisite selection of La Jolla homes for sale. Read more about La Jolla CA real estate. Del Mar is an exclusive coastal town, long famed for its excellent beaches, superb surf and is, of course, host of the San Diego County Fair and home to the world-renowned Del Mar Thoroughbred Club. One will find Del Mar homes and condos to suit a whole manner of tastes, and this delightful beach hideaway offers an exceptional lifestyle. Discover why so many buyers are seeking a charming Del Mar property. A quiet, upscale community with a private world-class golf and tennis club, the Rancho Santa Fe real estate market is ideal for those looking for a walkable community with a rural, pristine atmosphere. Rancho Santa Fe homes come equipped with spacious lots and architecture that meets strict guidelines. Click to learn more about the community, and to view the latest Rancho Santa Fe listings. San Diego is felt by many to be one of the best places to live in the nation. With a Mediterranean climate, as well as an abundance of cultural attractions, nature preserves, and world-famous beaches, San Diego homes and condos offer buyers something special. Find out more about relocating to San Diego, and browse all San Diego homes for sale. Of all the decisions you make in the course of buying or selling La Jolla real estate, selecting the right agent is undoubtedly the most important. The person you choose will be your guide and your professional advisor. With Dennis DeSouza and his team of San Diego REALTORS ®, you can be confident knowing that their experience and local expertise is unsurpassable. Contact us to learn more about our services, or to arrange a tour of homes for sale in San Diego County.